Explanation: Tonight, those blessed with clear skies can enjoy a glorious Full Moon, (exact full phase at 0452 UT, October 26). In fact, the Moon will reach its full phase within a few hours of perigee, the closest point in its elliptical orbit, making it the largest Full Moon of 2007. On April 3, the Full Moon was within hours of apogee, the farthest point in the lunar orbit, corresponding to the smallest Full Moon of 2007. 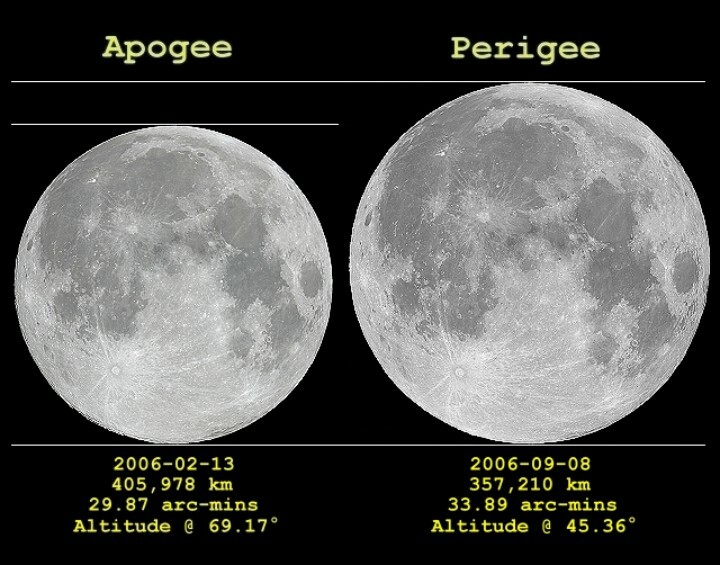 The difference in apparent size between the largest and smallest Full Moon is quite dramatic and similar to this side by side comparison of the lunar apogee/perigee apparitions from 2006. But seen in the sky many months apart, the change is difficult to notice. Skygazers should also enjoy the Moon on Saturday, October 27, as it encounters the lovely Pleiades star cluster. Because the Moon will be so bright, it will be easiest to spot the Pleiades stars near the Moon with binoculars or a small telescope.